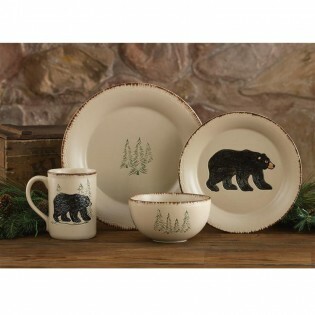 The Rustic Retreat Bear Dinnerware features a soft off white background with bears and pine trees. A decorative brushed edge accents the edges of each piece. The Rustic Retreat Bear Dinnerware is made of stoneware and features a soft off white background with bears and pine trees. A decorative brushed edge accents the edges of each piece.